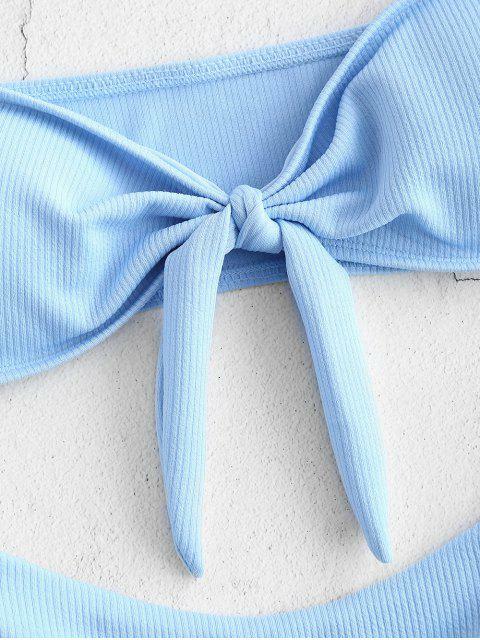 [19% OFF] 2019 ZAFUL Bowknot Rib Bandeau Bikini Set In LIGHT BLUE | ZAFUL .. This was my favorite bathing suit in my order. The material was great and the bottoms fit really well. Although the top was the slightest bit big. I ordered a size small. I’m 5’ 4”, 130lbs and a 34A. Cut from rib stretch fabric, the bikini top is shaped into an anti-tan line bandeau silhouette with a neat knot detail at the center to accentuate the curves of the padded cups, and the matching bottoms are cut at an angle. Team yours with oversized sunglasses and embellished sandals for a summer-ready ensemble.